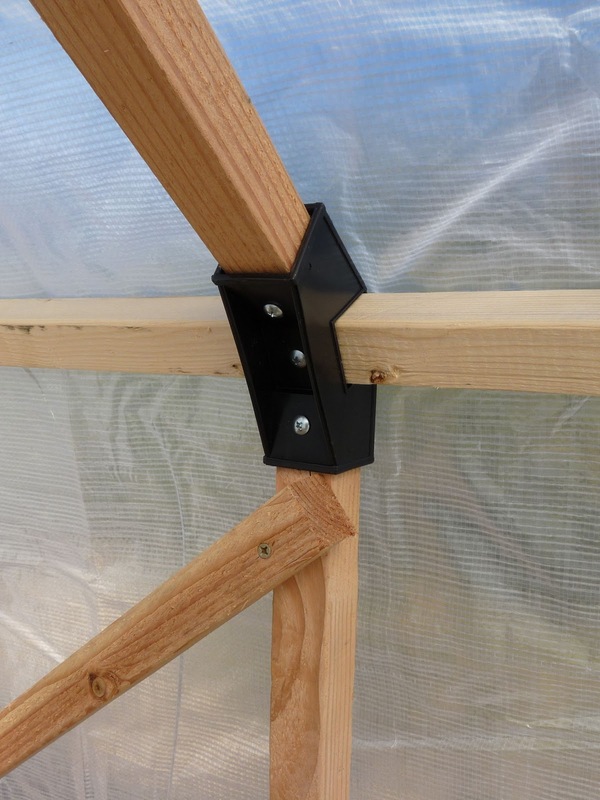 When I last wrote about putting together this small greenhouse project in early December 2011, an important piece had busted in the process, leaving me flummoxed as to how to repair or salvage the project. Spouse to the rescue! While I was out running errands one day last week, he put on his thinking cap and fabricated a part to replace the busted piece. He used a scrap of flashing, duct tape, some screws, and mitred two of the 2"x2" boards to align with the roof peak board (I know there's got to be an official name for this part of a roof - I'll figure it out someday). He then planed down some of the other 2"x2"s so that he wouldn't bust any of the other pieces like I did. Smart. He put it all together, and it was waiting for me when I got home. *swoon* I think I'll keep him. Tough to see, but the bottom connector is down there. 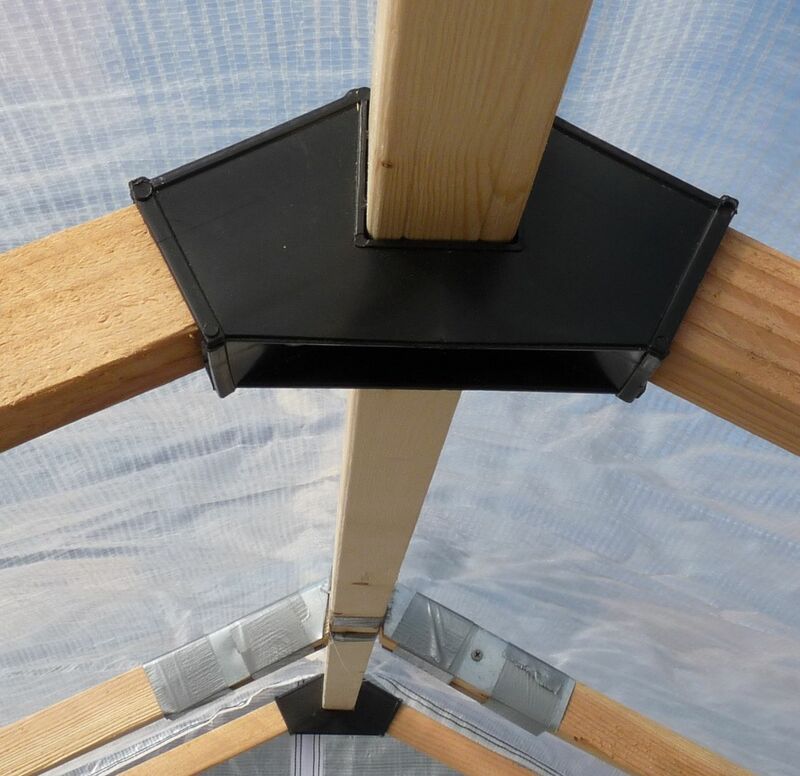 The greenhouse cover is zippered on both sides, and the material is fairly sturdy. I don't know what percentage of light it lets through, however, so when I start seeds I may install a full-spectrum bulb to ensure proper germination. If you're interested in putting together one of these structures, you can find the kit and the greenhouse cover online (nope, I don't get paid for this review or for the link). Do some shopping around, as price varies. Amazon still has the greenhouse cover at a discounted price, but no longer appears to carry the connector kit at this time. And remember to factor in that you'll need to purchase the lumber. 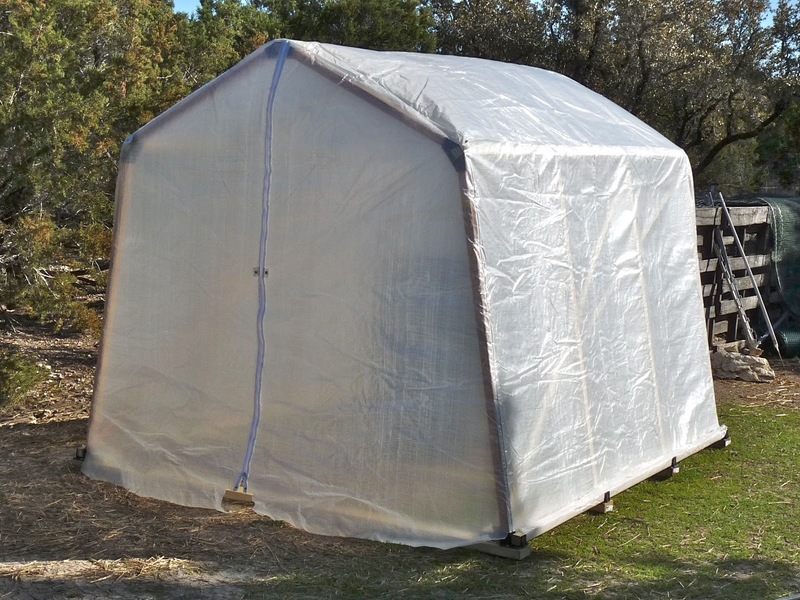 I think it's a good deal for the size of the structure (8' high x 8' long x 6 1/2' wide), but you could probably find a smaller greenhouse that's sturdier for the same amount of money. 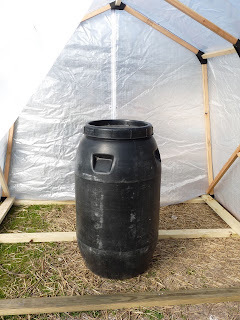 I also like that this structure is moveable (Spouse and I carried it with relative ease), and we can re-use it for different purposes in the Summer. In another flash of brilliance, Spouse remembered that a dark barrel filled with water can act as a passive solar collector/heater (if it gets enough sunlight during the day). Picked up a used 55-gallon food-grade barrel at the local feed store, and filled it up. Bonus: this will also act as an emergency backup water supply. Next: moving all the over-wintering plants into the greenhouse. 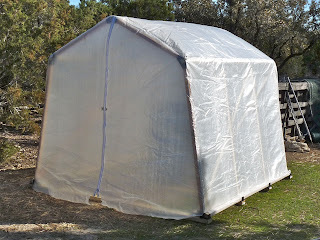 I can take down the rigged wood structure under which our plants currently reside, and put away the overnight tarp. Yay!!! 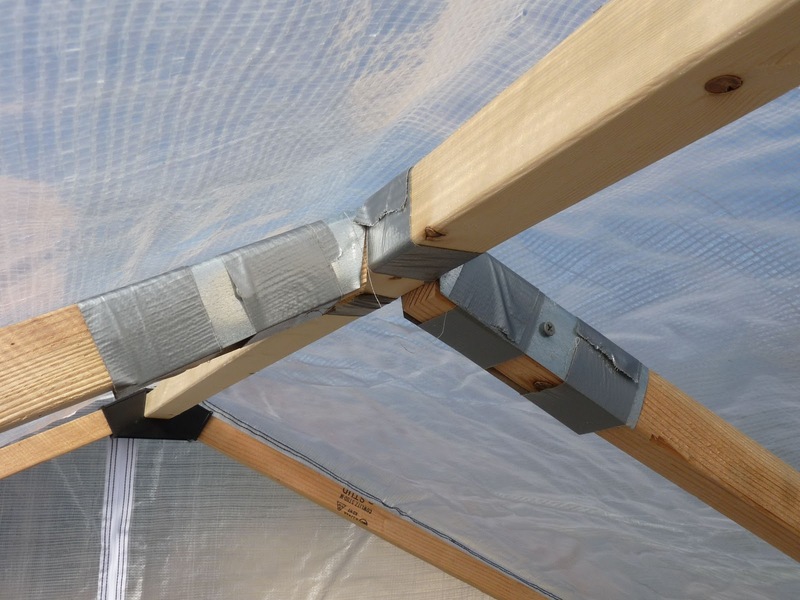 Duct tape to the rescue! Looks great. I have greenhouse envy. Wind must not be too bad though, right? We get huge winds here sometimes and it about knocks me over sometimes. Do you have a way to tie it down or shelter it? Threaded comments now enabled on blogger! I don't know if this feature also emails the original poster, so let me know if you got notice about this reply if you would please... thanks! Yep, I got the email notification that you replied. I want a greenhouse very badly, as do my indoor plant refugees! @warren: I hear you about the winds, we get some fierce ones here as well. Wondering if it has something to do with the hills, as I know you live in some gorgeous ones there - WV is so beautiful! Anyhow, we were (and still are) getting gusts up to 35MPH since last night, and so far, so good. Now, this is with the cover all zipped up - it may not be so sanguine if the "doors" were open. 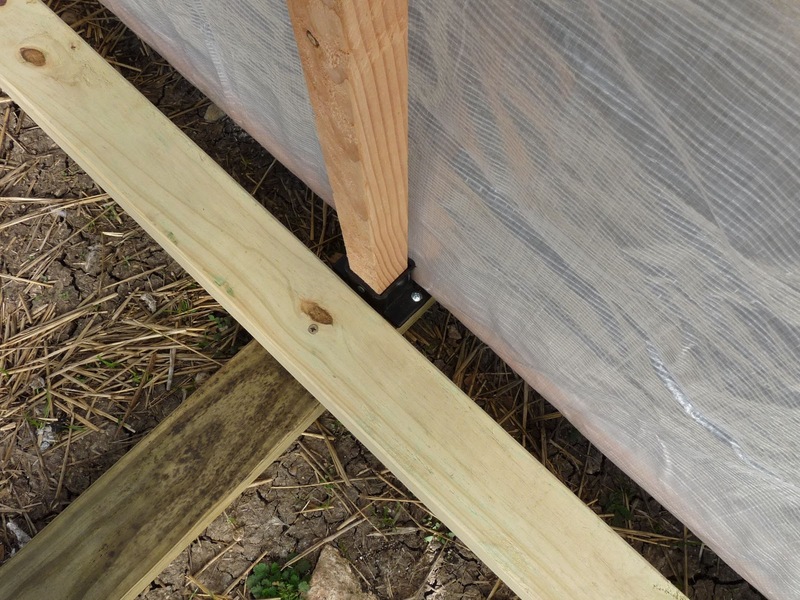 I may drill holes in some of the floor 2x4's and drive in some home-made rebar stakes, or maybe stake some metal fenceposts and tie down two opposing corners. Where do you get the connectors? Alas, 2x4 Basics doesn't seem to be selling this kit anymore. You can try a Google search to see if any vendors are selling what few leftover kits are left. Sorry!